I have for long intended to take a close look at the several sins Krishna is accused of both by Indian culture and by westerners. When I recently read Elaine Fisher’s paper The Devious God: Mythological Roots of Krishna’s Trickery in the Mahabharata, which heavily depends on material from such scholars as Bimal Krishna Matilal, Alf Hiltebeitel and Wendy Doniger O’Flaherty, my desire became stronger. It was then that I received a call from a friend of mine, a professor, an author and a scholar of great repute himself, who calls me up once every couple of months from the other side of the world to discuss long distance different aspects of Indian culture. My friend loves Krishna. 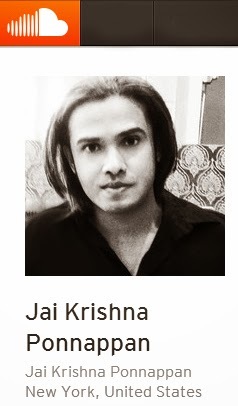 This time his question was about the ‘apparently immoral acts of Krishna,’ as he put it. How do we explain them, he asked. I have dealt with this question in part in my article Krishna: A Study in Transformational Leadership, available online, based on a class lecture I gave at XLRI School of Business a few years ago. However, I felt it is a good time to take that closer look. One of the sins Krishna is accused of is the way he achieves Bhishmavadha – getting Bhishma ‘killed’ at the hands of Arjuna. And that is what I shall look into in this study. Shantanu, seeing the impossibly hard thing done by Bhishma, being pleased with him, gave him the power of death at will. Bhishmavadha happens, as everyone familiar with the Mahabharata knows, on the tenth day of the epic battle. Krishna is accused of deviousness and duplicity here. He is accused of making the Pandavas go to Bhishma on the night of the ninth day and seek from him the secret of how he could be killed. Then, as suggested by Bhishma, during the next day’s battle he has Arjuna hide behind Shikhandi and kill him while Bhishma gives up battle seeing Shikhandi in front of him. Now let’s take a look at the events as the Mahabharata describes them. I am following here the story as the popular Sanskrit text [Gita Press] narrates it and not as the Critical Edition does, though the quotations are mostly from the Critical text. The popular text is more detailed. Towards the end of the ninth day of the battle, Bhishma is in one of his fiercest moods. Throughout the day he had been in a fiery mood – the previous night Duryodhana had gone to his tent at night, riding a horse, leading a large procession, accompanied by musicians with several of his friends on elephants – making sure it is a very public affair. There he had practically asked Bhishma to resign as commander-in-chief since he was achieving nothing for him. On the ninth day Bhishma was fighting under this humiliation. The Pandava army was fleeing everywhere in dread. Such was the chaos unleashed in the battlefield by Bhishma’s slaughter that in the pandemonium that resulted fathers blindly killed sons, sons killed fathers and friends killed friends. Pandava soldiers were fleeing in every direction – they had removed their armours and helmets, so that they will not be attacked, and as they fled helter-skelter, their hair blew wildly in the wind. Krishna has the greatest respect for Bhishma – perhaps he respects him more than he respects anyone else in the Mahabharata, with the exception of Vyasa. But he now realizes killing Bhishma is a desperate need and it cannot be delayed any further. He asks Arjuna to fulfill the vow he had taken in the middle of kings at Virata – that he shall kill Bhishma in battle. He then reluctantly asks Krishna to take the chariot to where Bhishma is and says he shall now fell [pātayishyāmi] Bhishma. Krishna does that, but soon realizes that Arjuna is not fighting as he should – while the grandsire is ferocity itself, like the fire that engulfs everything at the end of the world [yugāntam iva], Arjuna is still fighting mildly [mrduyuddha]. Krishna watches it for a long time, while mighty warriors and ordinary soldiers alike fall dead all around him, cut down mercilessly by Bhishma. Finally, he is unable to stand Arjuna’s softness to Bhishma any more. He knows the damage Arjuna’s attitude is doing, the devastation it is causing to his own army. Enraged, in a moment of exasperation, he drops the reins and jumps down from the chariot possessed by a blinding fury. With no weapons in hand, holding just his charioteer’s whip, he races towards Bhishma like an angry storm. His eyes are red. The earth shakes at every step he takes. People who watch the scene shiver in terror and cry out spontaneously – “Bhishma is finished, Bhishma is dead”. Arjuna himself jumps down from the chariot now and runs after Krishna. He clings to him from behind and reminds him of his vow not to fight in the war. Such is Krishna’s rage that Arjuna’s hold from behind has no effect on him and he drags Arjuna along, as he continues his race towards Bhishma. Then Arjuna tries to hold him back by clinging to his feet. He now declares to Krishna that he shall kill Bhishma. By then Krishna has taken ten more steps dragging Arjuna along with him. When Arjuna makes that promise, Krishna, still fuming and silent, but pleased with what Arjuna has said, walks back towards the chariot. Soon however the sun sets in the west and the battle is stopped for the day. That night the Pandavas sit in consultation among themselves, along with Krishna and perhaps other leaders on their side. During the discussion Yudhishthira confesses to Krishna that he does not like the idea of battling against Bhishma [na yuddham rocate mahyam bhīshmena saha mādhava], but at the same time Bhishma is killing his soldiers in battle [hanti bhīshmo mahāvīro mama sainyam ca samyuge]. He also admits that when Bhishma is in his form, it is impossible to have victory over him [na tu bhīshmah susamkruddhah śakyo jetum mahāhave]. He sees only one solution – go to the jungle and live there, which according to him is a much better option [vanam yāsyāmi durdharsha śreyo vai tatra me matam.]. They are, he says, like moths flying towards their death and Bhishma is a blazing fire. Forget about the kingdom, their very survival seems to be in question. And, says Yudhishthira, his one desire at the moment is to remain alive [jeevitam bahu manye’ham jeevitam hyadya durlabham]. Yudhishthira speaks in this tone for long [bahuvistaram]. Krishna is moved by compassion [kāruNyāt] by the dharma-obsessed king’s grief and consoles him. He praises his, Yudhishthira’s, brothers, describing them surpassingly mighty and capable of winning the war by themselves. But if Arjuna does not want to kill Bhishma, then, he says, if he has Yudhishthira’s permission, he, Krishna himself, would enter the battle. Please give him permission, and he would challenge Bhishma, battle with him and kill him. There is nothing he would not do for Arjuna – he would pull out his flesh itself and give it away if that would help Arjuna. And so would Arjuna give up his life for his, Krishna’s, sake. Because of his friendship with Arjuna, it becomes his duty to fulfill Arjuna’s oath. Arjuna is not only his friend, but also his disciple and his relation. There is no deviousness here, no duplicity, no betrayal. Krishna does not recommend any guileful means to eliminate Bhishma from the battle. His plan befits the highest ideals of warriorhood. He would challenge Bhishma in open battle and kill him there right before the eyes of Duryodhana and his men. In fact, because of his commitment to Arjuna and the Pandavas he would even break his own word and enter the battle if that would help. The ill-fame that he would accrue through that does not bother him. Ill-fame never bothered Krishna at any time in his life once he knew what the right thing for him to do was. In this he is a complete contrast to Rama, for whom the opinion of the world was of utmost importance and for the sake of which, he would even abandon his wife whom he loved beyond words, who he knew loved him equally, and of whose purity he did not have the least doubt. Krishna does not take his decisions by asking himself what everybody will think. He might ask Arjuna that question, but never felt it applied to him. His commitment was to higher ideals than public opinion. Ninda, scandal and disrepute, has always followed Krishna like a shadow – Krishna never bothered about it, nor did it ever stop him from doing what he thought was right. Krishna also defines through his words here what friendship means. His friendship with Arjuna is the highest kind of friendship – nothing higher is possible. So is his loyalty to Arjuna. Well, Yudhishthira refuses to consider Krishna’s offer, which is the right thing for him to do. Showing the maturity befitting a man of his position and an elder cousin of Krishna, he says no to Krishna. He reminds him of his vow not to enter the battle. And then, as an alternative, he – Yudhishthira – places another idea before them all. It is central to our discussion to understand that this suggestion comes from Yudhishthira. And unprompted by anyone, all on his own. There hasn’t been even the shadow of such a suggestion from anyone present there – neither from Krishna, nor from the other Pandavas or the other people who were presumably there, like Dhrishtadyumna, Satyaki, Drupada, Virata and so on. This idea is Yudhishthira’s very own. Let me translate here from the Critical Edition the entire short passage in which Yudhishthira makes this proposal. “Bhishma has made an agreement with me, O Madhava, that he will give me advice but will never fight on my behalf – fighting he will do for Duryodhana. Such is the truth, O Lord. So he will give me advice and [through that] the kingdom, O Madhava. Therefore, let’s again ask Bhishma about how he can be killed – you and all of us together. So, if you like it, O Krishna, let us all go to Bhishma, the best of men, immediately and ask for his counsel. He shall give us advice that will be true and good for us, O Janardana. 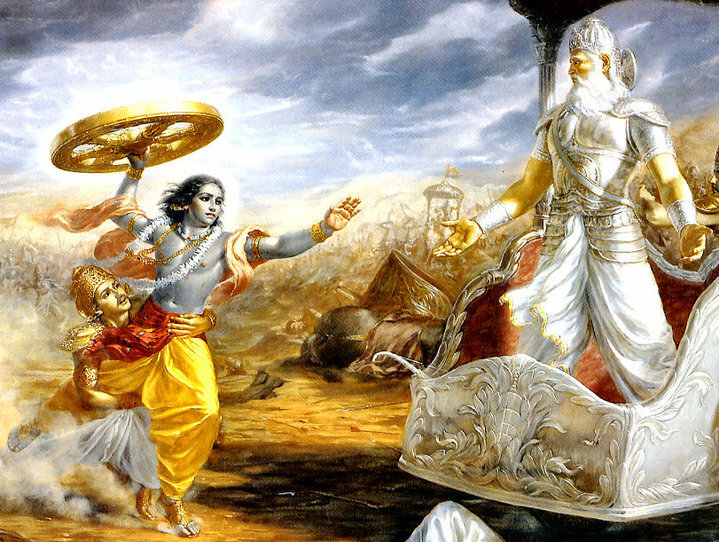 I shall proceed in this battle, Krishna, exactly as he will tell us. Firmly committed to his word, he will certainly give us both counsel and victory. “Since that is the unfortunate case, O Grandsire, I bow to you and ask, please tell me how you could be killed by others in battle”. Yudhishtira now knows that time has come. He uses the word ‘again’ here in suggesting they go to Bhishma now – bhūyah. What he means is let’s do that again now, as I had done on that occasion. Yudhishthira shows his nobility again here by recalling how Bhishma had looked after them lovingly, orphans that they were, while they were children. He regrets that it is that grandsire he has to kill and curses the dharma of the kshatriyas [dhig astu kshatrajīvikām]. Bhishma tells them that he will not fight Shikhandi on any account. The standard on Shikhandi’s flag is inauspicious, he is a transsexual, having once been a woman and then transformed into a male. He has vowed not to fight against anyone whose symbol is inauspicious or who is or once was a woman. He will not fight Shikhandi because of both these reasons. He then suggests that they put Shikhandi in front, or someone else of Shikhandi’s nature, and then fight him. Then from behind him, Arjuna should fell him. If they do that, their victory is assured. The Pandavas and Krishna bow to Grandsire Bhishma and come back. An atatayi is a great sinner. The meaning of the term includes anyone who is making an attempt on your life, even though he may not be a sinner otherwise. It is interesting to note here that even now Arjuna does not once say he shall kill Bhishma. That is an unacceptable duty that he would perform, but he would not admit it, or name it, even to himself. It is ‘we’ who shall kill Bhishma – not ‘I’. Not Arjuna. We see here then that Krishna has no role whatsoever in planning to have Bhishma killed through Arjuna who would fight standing behind Shikhandi. He was there when the suggestion was made by Bhishma, true. But the idea of going to Bhishma was not his, nor was the idea that Arjuna should attack Bhishma from behind Shikhandi. By telling Arjuna it is his duty now to kill Bhishma, Krishna does no more than what he is supposed to do under the circumstances. Honestly and in a straight forward way. With no deviousness. Let’s now see if Krishna uses any other devious means in the execution of the plan. Does he use any duplicity in the battlefield itself to have Bhishma killed on the tenth day, other than what was suggested by Bhishma himself? Skipping other details of this crucial day, the tenth day of the war, let us go straight to where the incidents that concern us take place. As the sun begins going down on the west, we find Bhishma tired of the carnage and devastation he has been spreading all around him for ten days. Deep despondency sets in and he now feels he has no interest in living any more. He just wants to die, and die fast. He does not any more want to continue the slaughter he has been doing for the last ten days. Yudhishthira announces to his soldiers and chief warriors that they need not fear Bhishma any more. They are going to have their victory over Bhishma now, because Arjuna is going to attack him, keeping Shikhandi in front of him. The warriors attack Bhishma, but they are opposed by Duhshasana. By then Arjuna joins the battle, attacking Bhishma, with Shikhandi as his cover. Other warriors join in on both sides. Shikhandi attacks Bhishma and wounds him, but Bhishma does not attack him in return. On one occasion, Bhishma is about to attack Arjuna with a mantra-empowered weapon [divyāstra] but at that time Shikhandi comes before him and seeing him, Bhishma withdraws the weapon. Soon the Pandavas, with Shikhandi before them, attack Bhishma as a team, surrounding him from all sides. His armour is in ruins and he is getting wounded at vital points, but that does not upset Bhishma. At one point he is battling with and wounding simultaneously six maharathis on the Pandava side – Satyaki, Bhima, Arjuna, Virata, Drupada, and Dhrishtadyumna. Arjuna chops down Bhishma’s bow with an arrow of his. The Kaurava maharathis get enraged at this. Seven of them together attack Arjuna – Drona, Kritavarma, Jayadratha, Bhurishrava, Salva, Shalya and Bhagadatta. Seeing them attacking Arjuna several Pandava heroes come running there – Satyaki, Bhima, Dhrishtadyumna, Virata, Drupada, Ghatotkacha and Abhimanyu. A hair-raising battle now ensues among these giants, which the Mahabharata compares to the battle between the Devas and the Asuras of old. After Arjuna has chopped down Bhishma’s bow, as the old warrior stands bowless, Shikhandi wounds him and his charioteer. He then destroys Bhishma’s flagpole. Bhishma in the meantime picks up another bow, which too Arjuna cuts off. Every time Bhishma picks up a new bow, Arjuna cuts it off. An angry Bhishma now picks up a powerful shakti, and Arjuna breaks that too with his arrows into five pieces. Bhishma knows he can strike back, but he remembers that it is his dear Pandu’s son who is attacking him, and also that Shikhandi is standing in front of him. He remembers the boon that he has received – his power to choose his own death. And he concludes that time has come for him to choose that death. He continues putting up a fight, but his fight now does not have the power it had all along. Arjuna realizes the decisive time has come. He attacks Bhishma with a steady flow of arrows. Shikhandi too continues attacking him. Again and again, as each time the arrows strike him with the force of pounding rods and the rod of the lord of death, with the force of maces and bludgeons, Bhishma, in unendurable pain, keeps saying – neme bānāh śikhandinah. No, these arrows are not Shikhandi’s. Soon there is not one inch in Bhishma’s body that is not covered by arrows. As the sun approaches the western horizon, the end comes. The mighty grandsire of the Bharatas falls down from his chariot, his head facing the eastern direction, the arrows piercing his body not allowing his old body to touch the ground. They form his final bed of rest – he will lie there in that condition long after all the slaughter of the battlefield is over and the war had ended in the victory of the Pandavas. He will await utttarayana, the northern solstice, to come and then when that period, considered auspicious to die, begins, he will finally end his life on earth. This then, in brief, is how the Mahabharata describes the incidents after the Pandavas plan Bhishma’s death based on the idea given by Bhishma himself. As can be seen, Krishna’s role in the subsequent events leading to the grandsire’s death is no more than that of Arjuna’s charioteer. In the final battle scenes that culminate in Bhishma’s death, we know Krishna is there because he has to be driving Arjuna’s chariot, but otherwise he is not active at all. Neither in planning the death of Bhishma nor in its execution does Krishna play any devious or dubious role. Krishna commits no sin in the Bhishmavadha episode. Note: All translations from the Mahabharata are mine. When the Sanskrit text is taken from the Bhandarkar Oriental Research Institute’s Critical Edition, the verse numbers are given before the verses. When it is taken from the Gita Press edition, verse numbers come after the verses. I have made certain compromises with the transcription of Sanskrit text since the blog does not recognise some characters commonly used for Sanskrit transcription.